Back when my parents moved out and offered us some of their old new rugs, I went through an extensive testing period where I tried each of the three in our living room to see if any would really and truly work. I'm not very picky about things, but I am particular about feelings. For instance, Dori and Scrappy (scroll to the bottom of the linked post for Scrappy info) I could sense were temporary visitors, but Bonnie instantly felt like part of our family. Also, Dori was pesky and Scrappy nearly killed one of our houseplants by peeing an enormous flood on it. Anyway, one of those rugs was almost exactly like the (old, stained) one from Target we have now; it was the same design except the colors were different. I really liked it. The colors lent it a Southwestern kind of feel without being literal (like many rugs for sale on Craigslist are, and I'm thinking specifically of howling wolves in front of the moon, or bears pictured rummaging through the forest). And that's when I noticed that, thanks to that one rug's presence in our living room, everything began to look like a prop in a spaghetti Western. The round wood-and-metal bucket we keep firewood in on the hearth suddenly took on a wagon wheelish quality. That really cool hand-hewn wood vase on the mantel looked suspiciously like a drinking gourd. 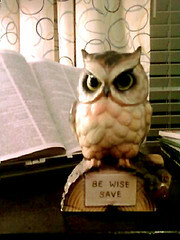 The kitschy owl money bank ("Be Wise. Save.") on the piano gave off a barn own aura, financial advice notwithstanding. And then there was the Native American wedding vase on the bookshelf. So that rug didn't last, mostly because I didn't want to feel like I was living in an episode of Deadwood, and not just because of the prostitution. This has been the longest setup in the world to make the statement: Even one small thing can totally change one's perception. Today I realized I was a girl with a nose ring shopping at Costco in a tie-dyed maxi dress and Birkenstocks. Maybe this is why my mom is so concerned about the status of my undergarments. Gotta love a good braless-from-Berkeley reference.